In the original cartoon, his character was worse than useless, and his design didn�t really scream �survivor of millions of years of conflict�. �Survivor of All-You-Can-Eat Crab Legs Night at the Sizzler�, maybe, or "survivor of a botched lap band surgery". As such, until 2006, I only owned one version of the character: a Pretender Bumblebee, sans Pretender shell. Those were magical days, full of laughter and financial security, when Bumblebee sat forgotten, taking up two square inches of my shelving and approximately none of my heart. Then the Dark Time came, with Bumblebee toys flooding store aisles and a complete financial collapse (though I'm willing to concede that that was mostly unrelated), and suddenly I found myself with an entire shelf of the yellow bastards. As such, I declared a moratorium on the character, and swore that he would never again darken my door. Imagine my surprise, then, when I found myself intrigued by the new Robots in Disguise Bumblebee. I held out as long as I could, but I finally, grudgingly bought him to quiet the voice in my head that commands I spend money I don�t have. Since then, I�ve bought every toy in the wave (with the exception of Steeljaw, who doesn�t really do anything for me but that simply guarantees I�ll want him later and not be able to find him), and it�s all Bumblebee�s fault. I have never hated Megan Fox as much as when she called Bumblebee�s vehicle mode a �piece of crap� in the 2007 movie, and I was incredibly disappointed when her misinformed drivel made him reformat into a concept Camaro. The movie treats this as a massive upgrade, but I�ve never been a big fan of today�s sports cars; they remind of a plush '57 Bel-Air I had when I was a child, all weird puffy curves. I understand that the lines of modern sports cars reduce wind resistance and the like, but there�s something to be said for the straight lines and implied power of an old-school muscle car. 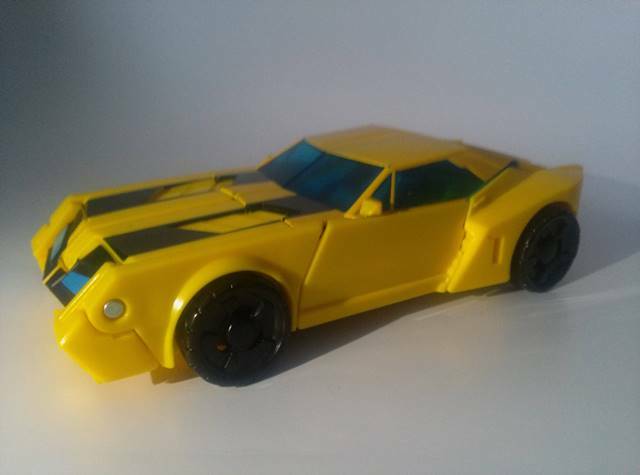 As such, I was thrilled to discover that his vehicle mode now is a stylized muscle car reminiscent of the 70�s Camaro used in the films. The now-standard racing stripes are present, and actually look far better on this style of car than the others in the past few years. The detail in fairly decent, with no small amount of moulding on the bumper, roof and trunk. The level of detail in this vehicle is high without being busy, though the brake lights are seriously lacking. Looking at the character model, the brake lights on the tips of the rear quarter panels are supposed to be red, but haven�t been painted, and it would have added a nice bit of color if they were. However, it�s not enough to detract from the look of the toy, and some of the details that have been added (like the hood vents and the 100% translucent windows) more than make up for it. A strong vehicle or robot mode isn�t really enough to sell me on something, anymore. I�ve got to be reasonably certain it�s going to look good in both, and Bumblebee does not disappoint. The biggest selling point for me is the fact that this Bumblebee shares no more than a color scheme with previous versions. 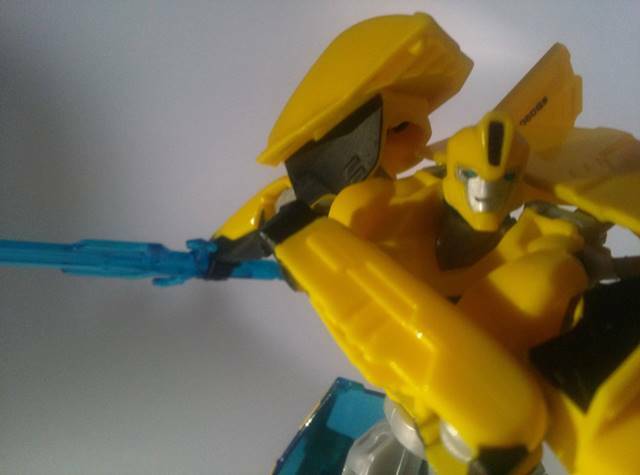 While Transformers: Prime Bumblebee shared the movie aesthetic, and Animated Bumblebee was a stylized homage to his Generation One counterpart, this toy shares very few visual similarities with past incarnations; he has the door wings, for example, but they�re much more like TF: Prime Smokescreen�s vertical doors. Overall, the figure has enough articulation to be reasonably poseable, but not so much as to be fiddly or hard to stand up. The hood of the car folds up on to the back of his legs, which can make some poses slightly difficult, but you can still get some pretty dynamic poses out of him. As with the vehicle mode, the detail and paint apps are simple and neat enough to add to the look of the toy rather than detract. Fortunately, the general design of this figure is such that he looks enough like the Prime toys to be right at home with them, rather than the massive shift in style the series occasionally experiences (a la Cybertron to Animated). The smirk on his face gives him a puckish quality that I find rather fun, but that may just be me projecting something onto him that isn�t there. Maybe eons of battle have given him facial paralysis that draws the corner of his mouth up into some horrific rictus, and this will play a huge part in his character arc as he makes peace with the things that have happened to him. Guess I�ll have to wait for the show to find out. Finally, I can�t help but point out his weapon. Any time a toy comes with some weapon other than a generic gun, I�m at least mildly curious; well, Bumblebee has a sword that reminds me (through the power of Fuzzy Memory) of the sword from He-Man. Make of that what you will, but I guarantee this means he will be in some version of He-Man's "I HAVE THE POWER!" pose at pretty much all times. Scanning the Autobot logo on Bumblebee's chest unlocks an upgraded version of the character with higher stats than the starter character. The one drawback is the fact that scanned characters "return to Cybertron" and have to be rescanned if you don't use them every day, which I can see being endlessly frustrating. I'm sure this is meant to keep people from going to Target and scanning all the toys there, but surely the time limit could have been a little longer? A week, maybe, or two? Generally speaking, though, this is a nice bit of added play value if you are buying the toy for your child or an easily-entertained adult. 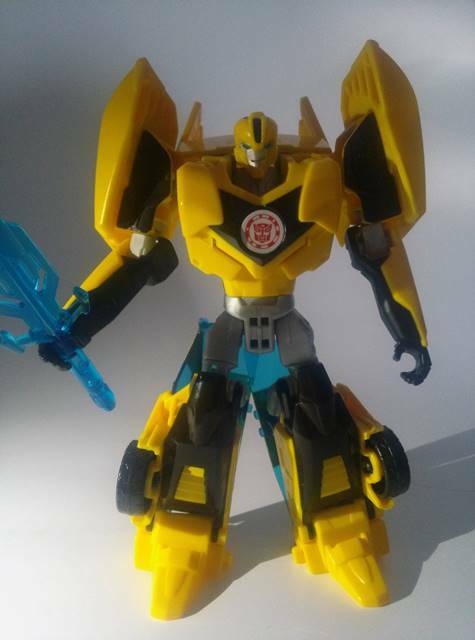 Transformation Design: 7 �Bumblebee manages to walk the line between simplicity and a decent transformation really well, better than most toys to have come out in the last year. His transformation is easy enough that most anyone would be able to transform him without instructions, without compromising the look of the toy. Durability: 8 � Seems pretty stable. There are a couple of parts that have made me nervous, but I think that�s mostly in my head. The joints I�d be most worried about are either designed to be detachable, or are ratcheted. Fun: 10 � I�ve not been able to put him down since I got him. He�s a really fun take on the character, and I find myself playing with him without even realizing it. Aesthetics: 8 � Robots in Disguise has moved away from the simplified movie aesthetic of Prime, and created a funky little bot that I�m really quite fond of. He has enough articulation to be able to pose well, without having so much as to have difficulty standing up on his own. Articulation: 7 � Bumblebee has a decent amount of articulation for a toy its size, but the leg kibble limits range of movement to a certain degree. Price: 6 � He seems a bit small for a deluxe, but not so much as to cause outrage. Besides, his other qualities more than make up for it. Overall: 7.5 � Provided you�re not already sick of Bumblebee (or even if you are), this is a new take on the character that looks great in both modes. He�s well worth picking up.